The bottom round, also called outside round, is the outer part of the round where muscles are well exercised, so it contains tough muscles. Bottom round is tougher than the top round and is definitely a marinating steak. A marinated bottom round can be grilled, broiled, pan-seared or can also be cooked slowly with moist heat called braising. Click Here To Cook A Bottom Round Indoors. 1. Trim off any excess fat, mix together the marinade according to its recipe. For best results place the bottom round steak in a resealable plastic food bag with 1/2 to 1 cup(250ml) of marinade, squeeze any air from bag, refrigerate 6-24 hours. A resealable bag will cut down on clean up, and allow you occasionally to turn the bag to evenly distribute the marinade. You can also marinade in plastic, stainless steel, or glass containers, covered with a lid, but do not use aluminum or tinfoil. 2. 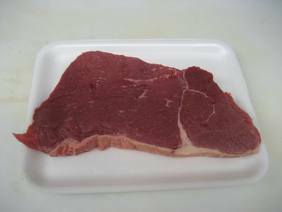 Remove steaks from refrigerator 1 hour before grilling to bring to room temperature. Remove the meat from the marinade and blot it dry using a paper towel, season to taste with salt and pepper. 3. If using a gas grill, first brush the grill with vegetable oil to prevent sticking, preheat on high for 10-15 minutes with lid down. 4. Scrape grill clean with grill brush, and adjust heat to medium high. 5. Cook the steaks turning once, for best results cook to medium-rare 135 degrees or medium 145 degrees, but no more, anything more will begin to dry out the steaks. 6. Remove steaks, tent with foil 5-10 minutes to allow the juices to redistribute themselves evenly throughout the steak, before slicing steak thinly across the grain. The steaks will rise another 5 degrees well resting. The above times are guide-lines, temperatures differ from grill to grill, do not judge a steaks doneness by minutes per side. 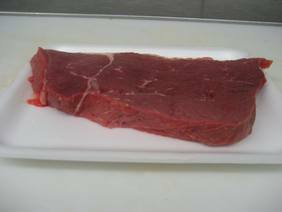 You should always use an instant-read thermometer to check the doneness of your round steak recipes.